The Conscious Healing Symposium is a one-day event in NYC featuring Lectures and Discussions by a cutting edge group of Integrative Doctors, Healers and Spiritual Practitioners organized by GFIM. 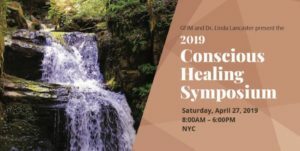 We will examine how Spirituality and Consciousness play a role in the Healing of ourselves and our Planet. Previous PostDr. Linda Lancaster on Good Day New York!